This months challenge on the Scrapology blog used a sketch by Liz Qualman. We decided to use Masks and Cosmic Shimmer Mists to create the background. I used white bazzill and layed the mask towards the top left corner then spritzed with Aqua Lagoon, and Blue Lime, then moved it lower and spritzed more Blue Lime and some Rich Gold which produced a less defined masked area. 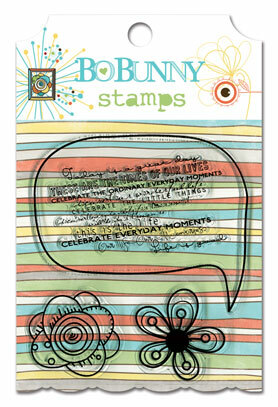 I used Bo Bunny Ad-Lib papers - Wild Thing, Pebbles, Vertigo & Stripe which are double sided. I cut some strips approx 5cm wide and 21cm/27cm long which I placed on the right. A wavy line from the stripe page was cut and placed horizontally. 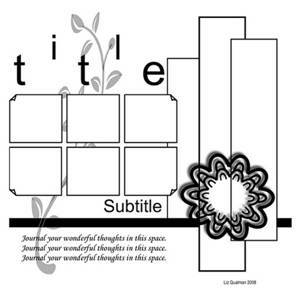 My photograph was divided into 5cm squares and I used paper strips for the journalling. My title was cut with Ashlyn's Alphabet and covered with glossy accents. Below is a close up of the masked area. The large flower was cut with the extra large retro flower punch. I stamped the centres of the "rose" type flower and cut them out, used an embossing tool to create dimension and layered them up. Items available from Cardinal Colours. Pop over to the Scrapology blog to see the other DT pages and enter the challenge. Pretty Page Linda - I like how the red in the paper picks up the red in the photo. Super page Linda, very striking colours. Love that you used the co-ordinating stamps for some of the flowers. fab page, love all the colours.